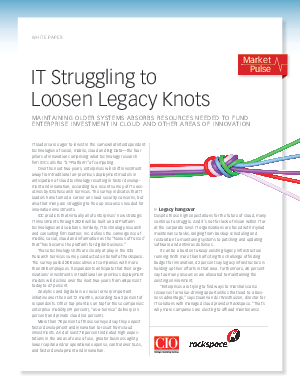 > Research Library > Rackspace > Is Your Legacy IT Choking Innovation? As a C-Level Exec, you are eager to invest in innovative technologies including social, mobile, cloud and big data and mobility. But on paper, you just can’t afford the additional resources to do so. This paper explores the options IT management has to reallocate the resources currently over-allocated to maintaining legacy systems infrastructure so that your brightest company resources are dedicated to core business objectives.